For the first time in more than 50 years, a door that is opened at the western end of the historic linear accelerator at the Department of Energy’s SLAC National Accelerator Laboratory casts light on four empty walls stretching as far as the eye can see. This end of the linac – a full kilometer of it – has been stripped of all its equipment both above and below ground. Over the next two years it will be re-equipped with new technology to power another wonder of modern science: an X-ray laser that will fire a million pulses per second. The 2-mile linac is a familiar sight to motorists who pass over it on Interstate 280 near Sand Hill Road in Menlo Park. For decades, it accelerated electrons for experiments that explored the fundamental nature of matter and resulted in three Nobel prizes: two for the discovery of subatomic particles and one for confirming that protons and neutrons are made of quarks. Starting in 2006, the final kilometer was converted into the Linac Coherent Light Source, a DOE Office of Science User Facility that uses the original accelerator equipment to generate X-ray pulses for a free-electron laser. Based on the extraordinary success of LCLS to date, the DOE recently approved a billion-dollar upgrade, LCLS-II, that will require the installation of a new, superconducting accelerator, to be built at the west end of the linac. The first one-third of the accelerator housing, located 25 feet below ground, has been stripped of aluminum alignment pipes, copper accelerator tubes and a complex maze of cables and electronics that turned a physicist’s dream into the first beams of accelerating electrons in 1965. Over the past several months, 699 tons of materials were removed from tunnel and gallery, amounting to 106 truckloads, according to Carole Fried, deputy project manager for the removal and disposition of the equipment. The bulk of the equipment that was removed had been installed in the original 1960s linac construction. The accelerator underwent numerous changes over the decades, however, including the addition of the SLAC Energy Doublers, which boosted the power to the accelerator in the 1970s, and the installation of upgraded klystrons – microwave tubes that power the accelerator – as part of the SLAC Linear Collider constructed in 1983. “Over the years many of the controls electronics have been replaced as well, so we removed components from every era of SLAC’s operation,” SLAC’s Scott DeBarger said. DeBarger oversaw the relocation of equipment before equipment removal began. Between April and July, more than 5,000 items were recovered– including klystrons, magnets, copper waveguides, vacuum pumps, control systems, position monitors and more – to be used in current and future projects at the lab. 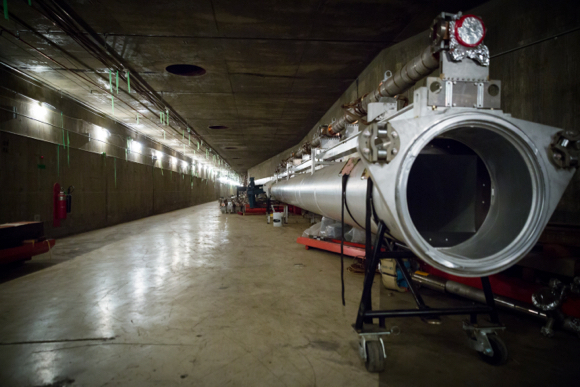 Later this year, the empty tunnel will be refurnished with state-of-the-art cryomodules that will form the superconducting portion of the upgrade to SLAC’s Linac Coherent Light Source, known as LCLS-II. The modules will be filled with liquid helium to cool the cavities to a chilly minus 456 degrees Fahrenheit. The ultracold technology will be used to create bursts of high-energy electrons 8,000 times faster than its predecessor and generate X-ray beams that are 10,000 times brighter. The cryomodules are being built at Fermi National Accelerator Laboratory and the Thomas Jefferson National Accelerator Facility. 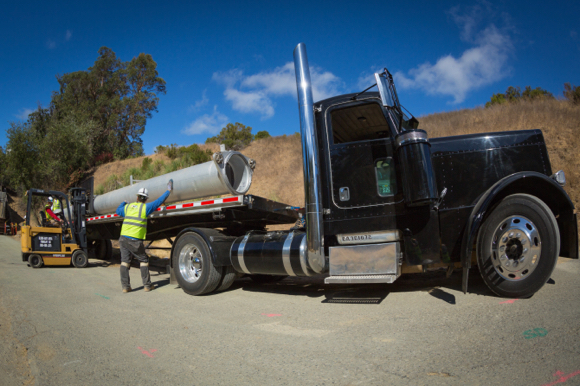 Before they are delivered to SLAC and installed, new infrastructure will go into the accelerator tunnel, including hookups to water and power. Above ground, solid-state microwave amplifiers will replace klystrons in the gallery. All photos courtesy of SLAC National Accelerator Laboratory: (top) Section of SLAC’s historic linear accelerator in the final stages of being disassembled (second from top) A darkened and empty stretch of the klystron gallery awaits superconducting accelerator equipment (third from top) Workers load a section of light pipe onto a truck. In total, 699 tons of materials –106 truckloads – were removed from the accelerator tunnel and gallery. 250,000 what did it cost in 1965?